The Luddite fallacy is the simple observation that new technology does not lead to higher overall unemployment in the economy. 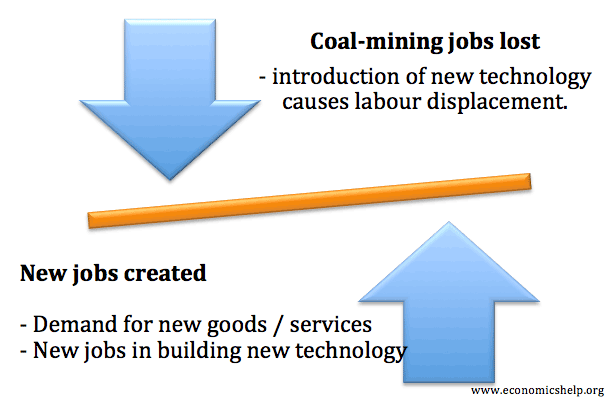 New technology doesn’t destroy jobs – it only changes the composition of jobs in the economy. 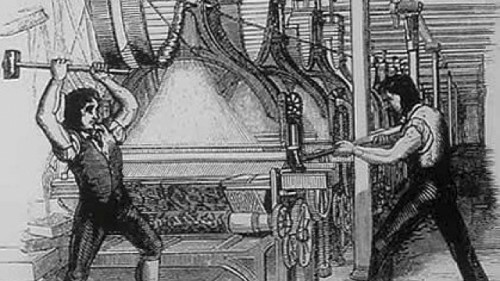 The Luddites were a group of English textile workers who violently destroyed machines. They broke up power looms because they feared that these new machines were taking their jobs and livelihoods. Against the backdrop of the economic hardship following the Napoleonic wars, new automated looms meant clothing could be made with fewer lower-skilled workers. The new machines were more productive, but some workers lost their relatively highly paid jobs as a result. It was this unemployment of former skilled workers which led to the industrial unrest and direct action. A Luddite is also a term used (usually pejoratively) to describe people who oppose the introduction of new technology. The idea that new technology leads to job losses has persisted, despite the fact that economists are almost universally united in stating that new technology will not increase the long-term unemployment rate (though there may be temporary structural unemployment). Why do Economists say that new technology does not cause unemployment? Firstly, rapid technological change may cause some short-term temporary unemployment. However, economic theory suggests that jobs lost as a result of technological change will be created in different, new industries. When automated looms were built, it became cheaper to manufacture clothes. Therefore, consumers buying clothes would have experienced lower prices, and therefore, after buying the same amount of clothes, they would have more disposable income to buy other goods. For example, they may now be able to afford a train ticket to go and purchase a silk scarf in town. With technological change, we see increased demand for new products; therefore new jobs are created in the railways and shops selling more luxury items, such as scarves and hats. Also, there will be some jobs created in the building of the automated looms. With new technology, firms selling clothes will also be more profitable. This profit may be used to fund future investment and job creation. Over time, improved technology would mean that even automated looms become outdated. New technology may enable clothes to be mass produced with even fewer workers. Again, this would cause a relative fall in the price of clothes, and consumers would have more disposable income to buy goods, but also spend on labour-intensive services. This is what has happened over the past 100 – 200 years – new Technology has enabled the economy to move towards a more service sector based economy. Lower costs of manufactured goods enable us to be able to afford a wider range of goods and services. But, what happens when robots are created that can do service sector jobs? Suppose we can build robots which can cut hair, serve coffee and clean. Will this not finally cause technological unemployment? The principle will be the same. If robots can cut our hair, the price of haircuts will fall – leading to higher disposable income. We can spend money on other services which require human service, or we can use the higher disposable income to work fewer hours, but still maintains living standards. To some extent, we could say we could already build robots to serve coffee and serve meals at restaurants. But, which would you prefer being served by a robot or a human? But, in a sense it doesn’t matter – improved technology which enables lower costs, enables us to have higher disposable income and better living standards. Can technological change occur quicker than our ability to create and fill new jobs? However, technological change can cause relatively significant levels of unemployment, especially amongst unskilled workers. For example, technological improvements led to the relative decline of heavy British manufacturing (e.g. coal industry). Many unskilled manual workers lost their jobs. At the same time, new jobs were being created in the service sector, and for more high tech skilled jobs. However, because coal miners and steelworkers were often concentrated in certain geographical areas and had limited skills, it was often very difficult for them to get a new job. In the long-term, the unemployed should be able to take new jobs which are created. But, if the labour market is inflexible, then this time period may be quite considerable. Therefore, if workers are threatened with job losses as a result of new technology, the solution is not to stop technological change, but to overcome market failure in removing labour market inflexibilities. Education and retraining to help the unemployed find new jobs. Technological change leads to higher economic welfare, however, it is not necessarily a Pareto improvement. The mass of the population may see a small rise in living standards. But, some workers may see a dramatic drop in living standards, while they seek to find a new job. Therefore, to attain an overall Pareto improvement, there is a strong case for a government providing unemployment insurance relief and free training to the unemployed. In one sense, the Luddites were wrong. But, a total laissez-faire approach of the government is also misplaced. It was wrong to smash the machines, but it was also wrong for the government to completely ignore the plight of skilled artisans finding themselves without any income. Automation – pros and cons – a look at the changes in the modern economy resulting from increased automation. ← Should the UK stay in the European Union? In the light of recent High street retail closures how do we adjust our employment and economic model when goods are imported and sold online? There are only so many supply chain jobs that can be created so where are the new lower skill jobs going to come from? I think the reason that people still believe this is that they lack a clear understanding of current technologies and what they will enable (And their assumption that if it hasn’t happened in the past it can’t happen in the future). Well I won’t persuade you, but whatever. New jobs appearing only works as long as there are new fields left where humans are necessary, at a certain level new fields will use machines from the beginning. Suppose we have hard AI at least as good as human intelligence, coupled with robots who can perform any mechanical task at least as good as humans. What jobs do you propose will remain for humans? The only reason humans would have jobs is because other humans prefer it, which are only jobs where they have direct contact with other humans. If people don’t spend all their time interacting with service personal there simply won’t be enough to do to make everyone work like that except if they work for very short times or everybody alternates between being fulltime servants for each other. And quite frankly why would you want everyone to work in that situation, forcing everyone to work when robots do everything necessary would be extremly stupid and I doubt everyone will do service jobs if they don’t have to. Anyway we are far from hard AI and the hardware to go with it, but the luddite fallacy quite clearly wouldn’t be a falacy at that point. (Except if we artifically keep it one.) Is it really so hard to believe that we will reach a point where the rate of automation is higher than the number of jobs in new fields? There aren’t many things which can’t be automated with soft AI. You cannot say that without also mentioning people work a smaller portion of their lives than they used to. There was no such thing as retirement, paid vacation, college, part time work or a 40 hour workweek 200 years ago. These things were forced on the market by the government and labor unions, they would not have occurred in a laissez-faire economy, so the issue did not just resolve itself over the past 200 years, making it highly unlikely that it would do so in the coming 200 years when automation will progress much faster than it did previously. How high would unemployment be today if the standard still was working 60 hours per week, from age 12 until the day you die? Yes, but again there was a lot of government interference here, otherwise rural communities would still not have electricity today. Also, while it is of course possible the few remaining laborers of the future will hire a different strippers and musicians (everything else can be done by machines) every day, this is far from guaranteed, the formation of a large unemployable underclass (of not particularly talented, pretty or smart people from poor families) seems likely. That’s cheating: the “Luddite Fallacy” hypothesis is about conventional laissez-faire capitalism being able to cope with technological progress just fine. A reduction of working hours would not occur naturally in such a system (if American unions demanded it then American businesses would move to China), it would have to be forced by the government, so it is not an argument for the “Luddite Fallacy” hypothesis. The Luddite Fallacy Fallacy is the simple observation that every time a muscle or brain lobe has been challenged by a machine, the machine has won and so this pattern will obviously continue until human physical and mental abilities are completely obsolete. Every muscle of the human body had already lost its competitive advantage over machines. Many lobes of the human brain have also lost their competitive advantage. Alphabetizing, sorting, spelling, and calculating are routinely done by machines in modern societies. The trend is obvious. Additional brain lobes will be competitively challenged by machines and they will lose to the machines.